Every fundraiser knows that monthly donors are much more valuable to their organization than one time cash givers. But how can you be sure that you are getting the best out of your monthly donors? Here are 6 essential things you need to know about monthly givers. 1) Exactly how valuable is a monthly giver? As fundraisers, we all know that a monthly giver is more valuable than a cash supporter but do you know exactly how much more valuable they are? This needs to include the impact of retention rates, increased and additional gifts a supporter will make as well as the likelihood to support in other ways. With this information you can make the right decisions to drive your overall investment and acquisition strategies. In the right circumstances monthly givers can also be more responsive than your best one time cash donors when it comes to making a cash gift. What do we mean by the right circumstances? Usually this means an urgent appeal for money such as during a disaster appeal or an important event relevant to your organization. Don’t be reticent about requesting cash gifts from your monthly givers – even if they say no, just asking can also improve their retention. Monthly givers are typically 50% more interested in making a legacy gift to the charities they support when compared to cash supporters. Supporters who have direct experience of the issues and mission of the charity are more likely to become monthly givers than supporters who don’t have this personal exposure. The key take out here is that if you are not already doing this you need to be asking and capturing at every opportunity your supporter’s personal experience of your charity’s issue and cause and then using this in your targeting and messaging plans. 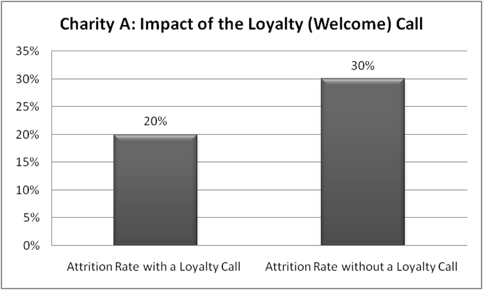 A thank you or loyalty call made within three months of the monthly gift being set up followed by regular stewardship communications can improve retention by over 30%. Secondly, simply asking a monthly giver to upgrade or take out another monthly gift improves their retention and commitment to you even if they say no to the actual upgrade request. Their responsiveness to subsequent requests is very dependent on the channel used to acquire them – much more so than with cash supporters. For example we know that monthly givers who are acquired by face to face respond very well to telephone requests to upgrade but won’t respond well to direct mail requests to upgrade.